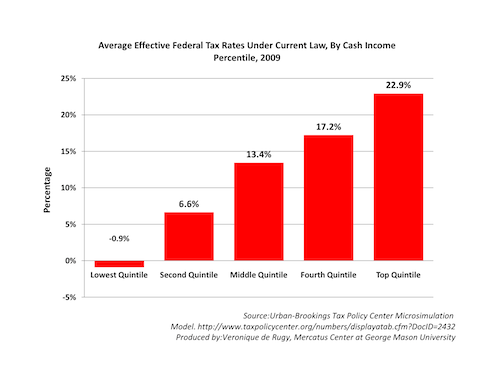 I have posted this chart before, but I think it might be useful to revisit it in the wake of the president’s speech about how rich Americans aren’t paying their fair share of taxes. As you can see, the top 1 percent of earners (a household income above $380,000) shoulder 38 percent of personal federal income taxes and make only 20 percent of income. The top 5 percent of income earners pay almost 60 percent of income taxes and make under 35 percent of all personal income. One important reason why the bottom 50 percent doesn’t pay much income tax is because lawmakers have decided to pay for social programs though the tax code and most of these people are either relatively poor or really poor. As you can see, the tax system is progressive. Does it mean that the rich pay their fair share? I guess it depends on how one defines fairness. But if the progressivity of the income tax doesn’t signal fairness, what does it signal? That being said, it’s important to remember that, fairness aside, raising the marginal tax rates on any group, especially those already paying the highest rates, could reduce GDP and income across the board, not just for the people paying the initial tax bill. Why? Because the burden of higher taxes on capital formation falls largely on labor in the form of lower wages and hours worked. The same is likely true of an increase in the capital-gains tax, which is what the president seems to have in mind with the Buffett tax. This move would increase the double taxation of corporate income and would seriously reduce capital formation and wages. And for these reasons, it is unlikely to raise much revenue.